We’re production transcription experts. Let us make your job easier with our production transcripts! Whether you’re in need of production transcripts for a reality show for television, a feature film, a documentary or anything in between, Alpha Dog Transcriptions can take care of all your production transcripts and transcription services needs. Alpha Dog Transcription been in the entertainment and production transcription business for over 20 years and understand what producers need: accurate production transcripts at a great rate and reliable customer service. WHY USE PRODUCTION TRANSCRIPTS ? As a producer, editing with production transcripts will give you the freedom to be more creative and you will be less stressed with your project. We guarantee it! * Editing bays can cost hundreds of dollars an hour. So it makes sense that the best way to save time and money is to go into post well prepared. With professional production transcripts by Alpha Dog Transcription your editor will quickly locate sound bites, b-roll shots, and easily understand your script notes so you get exactly what you want in the fastest time possible. 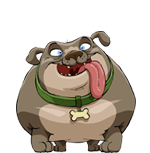 Alpha Dog Transcription also offers Finished Show Scripts. We can work with your sales agent, network/studio contact, or distributor to give them exactly what they need as part of your deliverables package. You may require additional services for your transcripts – we can do that too and much more! The post producers who work with us know we’re the most reliable, professional and accurate transcription house out there. We stand behind our transcriptions and make ourselves available to our clients 24 hours a day. Many producers refuse to use anyone else but Alpha Dog Transcriptions! Made in the U.S.A.!! We do not outsource your material to other countries as some companies are now doing. All of our transcribers speak English as a first language, have college degrees, and understand American accents, expressions, colloquialisms, slang, etc. We are highly selective when hiring transcribers (who are trained extensively in post-production transcribing) and each transcript is double-checked by a supervisor before final delivery. THE MOST ACCURATE TRANSCRIPTIONS – Paws down! 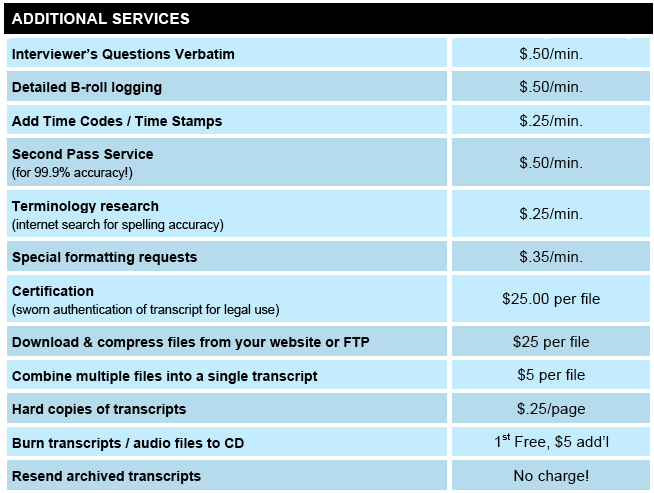 AFFORDABLE TRANSCRIPTION RATES – Get an exact quote with no surprises later with our Flat Rate Pricing. RELIABLE DELIVERY – Your order will be ready when you need it. Guaranteed. EXTENSIVE KNOWLEDGE OF THE INDUSTRY – We speak “Hollywood”. We know the lingo, the tech-talk, and how the business works on both sides of the camera. OUTSTANDING CUSTOMER SERVICE – We’re not happy until you’re happy! QUALITY CONTROLLED – Our entire transcription team is locally based and never outsourced. Your transcripts go through a thorough quality check before you receive them. MAKE ALPHA DOG TRANSCRIPTION YOUR ONE STOP SHOP! – Check out our Motion Graphics and FX department! Occasionally, there are issues with any given order. We will work with you to resolve any problems that pop up, but every once in a while we have to put in additional hours to make sure your transcripts are done on time and to the best of our ability. Alpha Dog Transcriptions will never charge you a fee without contacting you first and giving you the opportunity to fix whatever the issue might be. Our business hours are Mon-Fri 9 AM – 5 PM P.S.T. Our turnarounds are based on a 2 PM P.S.T. deadline, excluding weekends and holidays. Orders received after 2 PM P.S.T. will be processed the next business day. There is a 5-minute minimum per file. There is a $50 minimum per project. Each file submitted will generate its own transcript, we do not automatically combine files unless noted on Transcription Order Form (additional fee will apply). All files must be COMPRESSED to less than 3 MB in size per minute of content. Any files over 3 MB in size will incur an additional charge and delay your order by 1-2 days. For a 2-day or less turnaround, each file must not exceed 60 minutes in length.